This wordless picture looks deceptively simple, but is curiously absorbing. 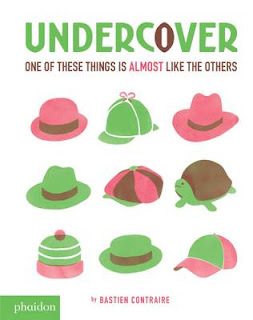 As the title indicates, it's not just about finding the odd one out, but of noticing all the things that are the same about the objects on each spread. 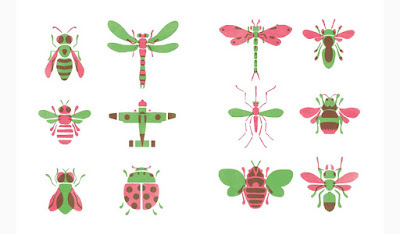 Simply stencilled duo-tone illustrations in pink, green, and the brown that results when those two intersect reduce the subjects to their simple shapes, and yet there can be so much diversity in the images. It would be interesting to go from this to making some critters or objects yourself from simple shapes and limited colours. This book was originally published in French, under the title Les Intrus which translates as 'The Intruders' which gives another angle on how the book works - are we looking for what is different, or what is the same, or what is disguised to appear part of the group? The wordless nature of the book also made me consider that they were maintaining their silence so as not to be discovered - just the kind of interesting thoughts that can come to mind when your brain has a chance to operate in the quiet.